I hesitated about writing my Oct. 12, 2011, post Annette Carpenter Decides and putting it up on this blog. Somehow, I felt like decisions that may mean life or death are too personal, too intimate to put out into cyberspace for anyone to read. The question I grappled with was “Does posting about such profound facets of my mother’s life and the impact on my life and the lives of her loved ones trivialize all that we hold most sacred and dear? First of all have been the posts of bloggers who are on difficult journeys of loss, pain and healing. Some have encountered loss so searing that I cannot fathom how they survived. The experiences they have shared and the discussions they sparked among their readers have often brought light, renewed determination and helpful survival and healing strategies into my own journey. The second experience was reading comments that visitors have left on my earlier posts. Kind and encouraging comments have led me to a firm conviction that I can trust readers with my truth. They have evidenced respect, even when their own beliefs may be different from mine. And there are blogger friends who have joined the friends, relatives and kind strangers who have sent up prayers and positive thoughts that continue to make a difference for me and my family. Finally, I chewed on the fact that when I began blogging my purpose was self-centered. I did not want to forget details of this stage of my life, my own retirement daze. Neither journaling via pen and paper nor computer had held my commitment. I have, however, persevered with blogging even though at times sporadic. And my original purpose still applies, but in the past few days, as I pondered what to post and what not to post, I realized Retirement Daze had evolved. In a continuous state of thinking about the what the next blog post would be, I had fallen into the habit of examining all my experiences from the perspective of what I want to remember. As I continued to post while I was and am coming through some hard things, I began to realize that sifting all experiences through a filter of “What I don’t want to forget” has had an unexpected side effect. It turns out that what I want most to remember are the good things, be they little or big, serious or ridiculous. That isn’t the unexpected side effect. The unexpected side effect is that there have been so many good things, even in the difficult experiences. That doesn’t mean that I want to erase the difficult or unpleasant. Perhaps it takes the difficult experiences to strengthen my recognition of the good things, the blessings. And good things shine even brighter for me against the background of the hard things. I wouldn’t choose the hard times, but they are part of the blessings. Now I am ever more conscious of the blessings that are generously and continuously pouring into my life. I don’t want to forget those blessings. I especially want to remember the blessings of comfort, hope and joy that were part of the challenging times. I want to remember the people and circumstances involved in the delivery of those blessings. It is disturbingly easy for me to forget. Posting helps me remember. And remembering helps me be thankful. And being thankful helps me trust in God’s care of my loved ones and me. And trusting helps me to hope and to heal. Yesterday was my mother’s fourth day since she decided to discontinue dialysis. During that time she has relished being snug in her own studio apartment without the prospect of facing a dialysis treatment. Lila, a dear sister-in-law, ferried me to Hattiesburg Thursday. We were on hand for the afternoon visit of the hospice admissions nurse. By mid-afternoon my mother, my brother and I were already recipients of the kind of reassurances and comfort that these organizations offer. And by the time Lila delivered me home, the admissions nurse had ordered a wheelchair and it had been delivered, allowing Mother to conserve her diminishing stores of energy. My mother in her apartment with four great-grands Charlie, left, Luke, Nate and Stella, front. Her Saturday was filled with visitors, including four of her six great-grandchildren. Sunday husband Walter and I visited. She still wants to “do” for me and help with my stroke recovery. She expended precious energy, sitting on the edge of her bed beside me, directing me in clearing out a corner by her chest of drawers where she had stashed books and magazines. That mother-daughter effort was a gift to me, one little thing I could physically do for her. Since my stroke it has mostly been prayer and phone calls to her and phone calls to doctors’ offices. I am thankful that there is no distance in prayer. It is always right where it is needed. Every time Walter and I head to the interstate for the 15- to 20-minute drive to visit his mother or the longer drive to visit my mother, we pass a church’s reader board. I have loved the message the reader board has displayed for several days now: “Prayer is the best wireless connection.” Yes! Lovely post Linda. I have been thinking about you. Yes, it is hard to share personal things, because we really don't know who will read them. My attitude is that my little posts will bore those who do not know or do not care about me, and my posts might entertain my friends a bit. As for personal stuff, we all have things we think are "too personal" but others probably experience them too. Your Mother sounds like a real treasure. I'm so glad you can spend some good Mother-daughter time together. 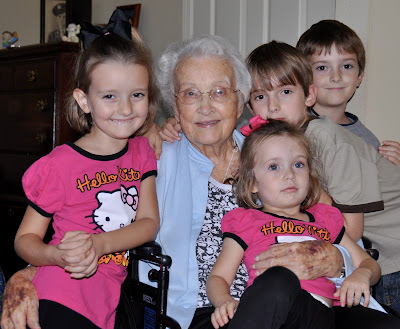 The photo with the Great-Grands is beautiful and a wonderful memory for them as well. Thinking of you today and praying the peace that passes all understanding is yours. I'm glad you are posting with honesty. I think it is a good thing to put things out as you have, allowing for some normalization; realizing others have similar feelings and challenges, and most important, empathy for our travails, is helpful beyond words. Both you and your mother have lovely attitudes. What a blessing! Another blessing is this time in your lives. Treasure it. Have no regrets. Dear Linda--Having seen the comment that you left at Ronni Bennett's about walking 1000 steps, I wished to come by to read your postings. After reading this one posting, I can feel your pain at your mother's condition and feel your joy at the time you get to spend with her. Good luck in dealing with your mother's situation (I would pray for you if I were religious!) and know that 1000 steps per day is a long journey for many people. I believe it is very important to ones like us to post what is important to us. It is also a journal for other family members to get to know us even long after we are gone. It is really like a living journal, with many people commenting, giving advice, and praying. And we so much need to be thankful for things both big and little. In this way, we experience joy and don't forget. God bless your sweet mom!!! Even now, she is such a blessing to so many! I can identify with what you had to say in this post on what to share and what not to share. I loved what you had to say. You write so thoughtfully. It is evident that great thought and deliberation goes into everything you say. I want you to know that you have given me such strength, such insight, such courage, and such hope as I have read all you have written in your journey. We may be women of faith, but we need fellowship for the journeys that God asks us to take. That is one reason why I appreciate reading what you have to post. Thank you for sharing your mother's story. She is a beautiful woman. Today, I heard Ann Graham Lotts say that her father, Billy Graham, has always been a handsome man, but now in his 90's he is absolutely gorgeous. I think I can say the same about your mother. There seems to be only peace and contentment in her face. I agree with you. Blogging helps us remember the blessings, the things we have to be thankful about, and trusting does help us to hope and to heal. You are an important agent in my own healing. I have learned from you. God bless you all at this time. Thank you for the update on your mother. She remains in my thoughts and prayers. I've discovered your blog only recently. I can say this. I have been in a daze of my own this last year as I, too, experienced a health challenge. Although my challenge is different than yours, I feel some connection with your efforts to regain strength and maintain equanimity. Like you, I've come to the conclusion that blessings have come my way, too. It's hard to remain a Type A person when your mobility and stamina are so challenged that you simply can't accomplish all the tasks you'd like to accomplish. You can, however, have a passel of grandchildren put on a play for you, and they have your absolute attention with no distractions! thank you for sharing your deepest thoughts and fears and challenges and love for your family. your mother is beautiful. I think sharing our lives helps others who read it. it helps put perspective on our lives, it helps you by saying it out loud and by the sharing back to you in comments. people who hold their thoughts and feelings inside do not heal as quickly. I beleive that is why you are doing so well in your recovery. share on, we love it. Hey, it's your blog and you can post any dang thing you want to. But as a retirement blog, you are dealing with an issue many retirees will face. The less lucky among us (myself included) faced these issues earlier. Frankly, the death of a cherished parent is tough, no matter what the age or state of health. I felt orphaned even though I was 40 years old at the time of my mother's death.